pseudoparanormal: A Horseshoe for Good Luck?? A Horseshoe is one of the original symbols for good luck and protection whether its jewelry, pictures, or an actual horseshoe. For protection, a horseshoe is suppose to be nailed above the doorway. There are two theories as to whether the horseshoe is to be facing up or down. In terms of the horseshoe representing good luck, in most of Europe, Mid-East, and Latin America it is known that the horseshoe is to be facing upward. This is so that the "luck doesn't run out." On the other hand, other nationalities believe it is to be hung upside down so that the "luck can pour down on you." For protective purposes, a horse shoe is to be pointing up, and that's to prevent witches from passing under the magical protective horseshoe. Where did the story of the horseshoe originate from? One story is quoted below from Dr. Doug Butler's, The Principle of Horseshoeing. Once upon a time, a wise old blacksmith was hard at work making horseshoes. The sound of the anvil attracted the attention of the devil. He saw that the smith was making horseshoes, and he thought it would be a good idea to get his own hoofs shod. So the devil made a deal with the smith and stood to be shod. The wise blacksmith saw with whom he was dealing, and so he nailed on a red-hot shoe, driving the nails square into the center of the devil's hoof. The devil then paid him and left; but the honest blacksmith threw the money into the forge fire, knowing it would bring him bad luck. Meanwhile, the devil walked some distance and began to suffer the greatest torture from the new shoes. The more he danced and pranced and kicked and swore, the more they hurt him. finally, after he had gone through the most fearful agony, he tore them off and threw them away. From that time to this, whenever the devil sees a horseshoe he turns and runs--anxious to keep out of the way of those torturous devices. I guess my luck won't run out and no witches will be paying me visits due to the fact of that my horseshoe point up! 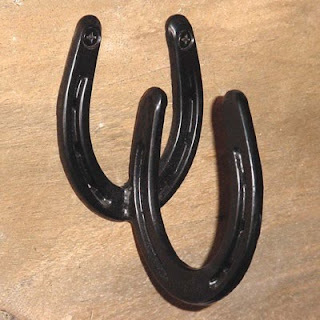 Interesting I never knew why horseshoes were considered lucky considering they are relatively unimportant other than keeping maintaining a horse's hoof. The facing up or down thing was creative. One of my teachers told me people used to hang horseshoes above their doors to prevent malevolent spirits from entering. The horseshoes were thought to resemble a womans's anatomy and the spirit would become distracted and not enter the home.